Coaching volleyball tips and specific drills for learning to spike. First, start out teaching END RESULT of spiking. So what's the END RESULT of spiking a volleyball? 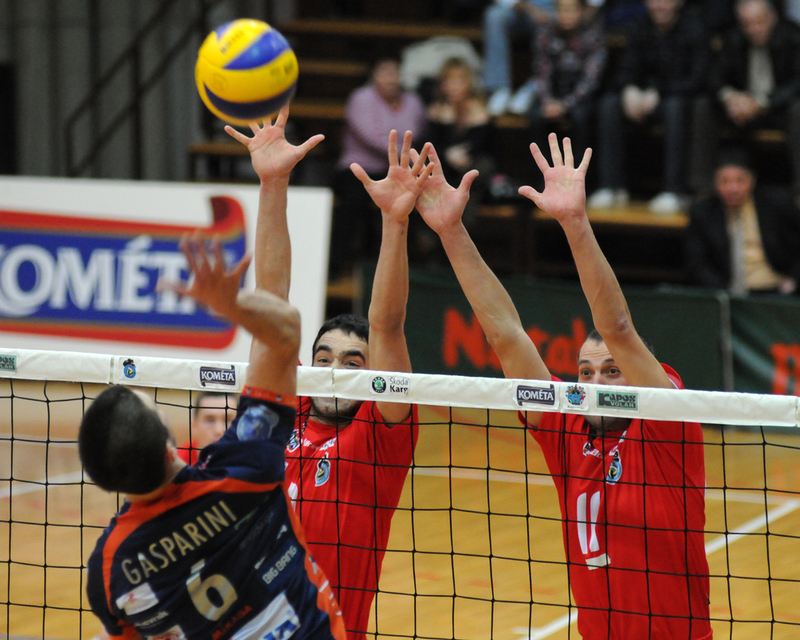 The desired END RESULT of spiking is hitting the ball in a way that scores your team a point. Being effective at spiking is so important in volleyball because spiking is the most effective way to score your team points. Make the ball spin (topspin). Basically, if you achieve all 3 of these things, you're likely to get the END RESULT you want. These 3 things should be the focus of training when first learning to spike a volleyball. The next step to learning to spike is to focus on POSITIONING. Many coaches make the mistake of not teaching POSITIONING, and go to focusing on the TECHNIQUE of the spike approach too soon. The volleyball spike approach can be defined as the TECHNIQUE used to get in POSITION to spike. In the long run, players are better off learning POSITIONING and END RESULT before focusing on the TECHNIQUE of approaching to spike. Platform Hitting Drills or "Spiking on a Box"
To become a consistent spiker, it's all about POSITIONING. The better a player is at getting in position to spike, the better they will be at spiking. This is why coaches tend to spend so much time teaching the volleyball spike approach. Before working on your footwork, focus on training POSITIONING. To improve POSITIONING, players should perform repetitions of hitting while standing at the net on a platform or box. Focus on hitting in the precise POSITION you want to be as if you were spiking a volleyball. Hit the ball above or in front of you, slightly to the left or slightly to the right. Your position depends on the END RESULT you desire. For example, if I want to hit straight ahead of me as well as hit the ball on the opponents 3 meter line, I will have the ball inline with my hitting shoulder and maybe 4 inches in front of my shoulder in a POSITION where my arm is totally extended. Hit the ball with topspin. Hitting on a platform is invaluable because you don't have to worry about your TECHNIQUE for approaching or making an adjustment to a bad set. In the beginning, you basically just focus on POSITIONING and END RESULT. The best international players spike as if they are "standing on a box" because they've developed the ability to get in POSITION so effectively. They've worked on POSITIONING so much, that they know what "good" positioning is. This is the key to being a great spiker. Also, another reason why the best spikers look as if they are on a box when they hit is because of how consistent their setters are. Do you see how important setting accuracy is? The best setters make it seem as though their teammates are "standing on a box" when they spike. The goal of setting is to make it easier for the spiker to get in POSITION to spike. After you have learned the correct footwork and approach TECHNIQUE for spiking a volleyball, the final step is to develop good ANTICIPATION skills. Developing good ANTICIPATION skills typically involves a lot of play in game situations. Being good at anticipating essentially means you are good at recognizing where the ball is being set which allows you to adjust your approach more easily. For example, if you can read your setter and can tell that the ball is going to be set tight to the net, you can take a quicker approach and jump closer to the net to get in better POSITION to spike. 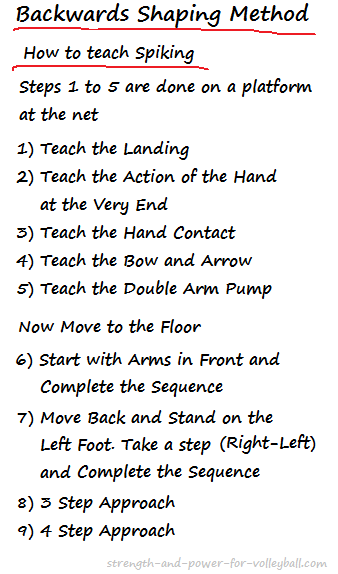 You can apply this system of learning to learn all other volleyball skills (spiking, passing, setting, digging, serving).